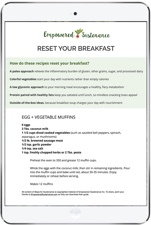 Today’s recipe is from Gillian Young, a holistic nutritionist who shares recipes and support for an autoimmune lifestyle. 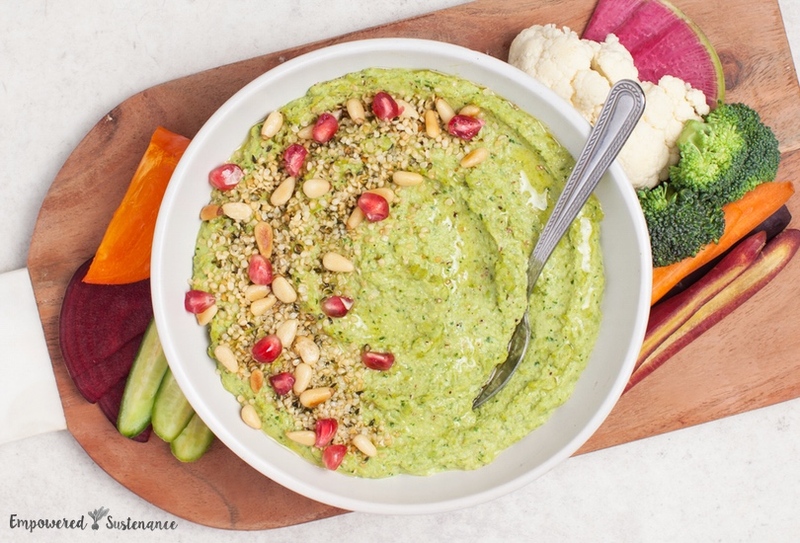 Hummus and veggies have always been one of my go-to healthy snacks. But when I began following a paleo diet to address my autoimmune issues, dried beans and legumes were suddenly out of the question. I started getting creative in the kitchen and came up with this simple and delicious green herb “hummus”. 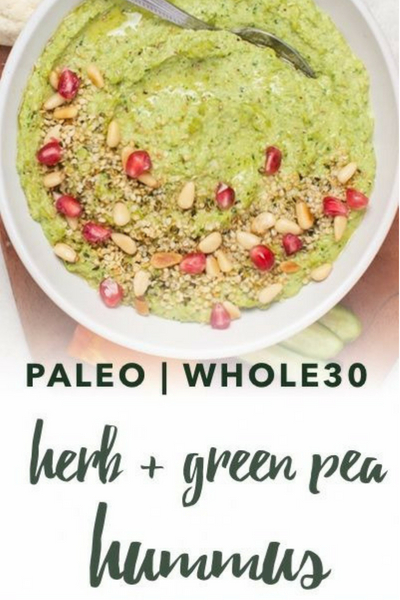 It’s made like a traditional hummus, only with fresh green peas instead of chickpeas and a kick of cilantro to keep things interesting. It makes an excellent appetizer served with chopped seasonal vegetables or as a complement to your holiday crudité platter. No matter the occasion, this dip is sure to be a winner! Garnish this dish with a drizzle of olive oil, and nuts or seeds of your choice. Pomegranate seeds, as an optional garnish, add vibrant color. Here’s a quick way to de-seed a pomegranate and separate the seeds from the pith. 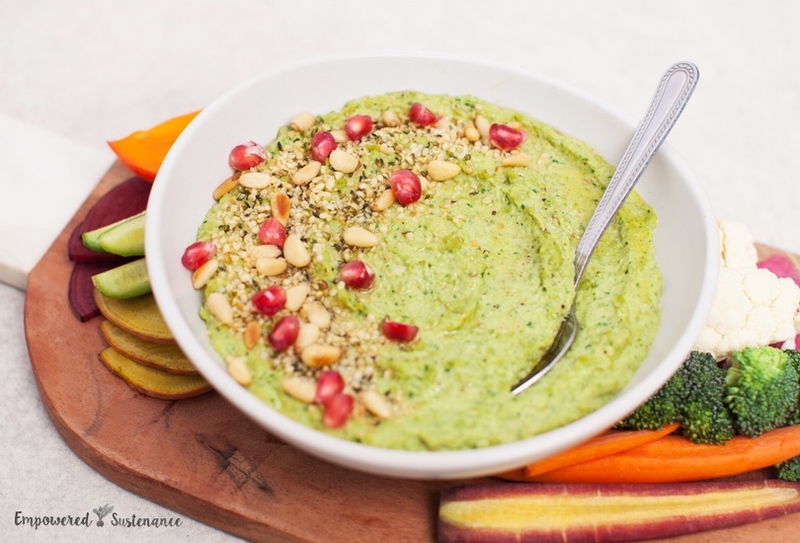 A bean-free hummus alternative made with green peas and cilantro. The perfect complement to fresh seasonal veggies or your holiday crudité platter. Blend on high for 30-60 seconds, or until smooth and creamy. You may need to stop and scrape down the sides with a spatula as you go. Scoop into a bowl and top with toasted pine nuts, hemp seeds and/or pomegranate seeds, if desired. Gillian is a Registered Holistic Nutritionist and founder of Wholeheart Nutrition. After a long journey with autoimmune disease, Gillian is passionate about helping others with chronic illness. With a holistic approach, she coaches her clients on their path to healing through diet and lifestyle interventions. Gillian writes about her experiences on her blog, in hopes to support others on their own wellness journey. When she’s not working with clients, you can find her dreaming up healthy grain-free recipes in the kitchen. For more of Gillian’s recipes and wellness tips, follow along on her website, Facebook and Instagram. But green peas are a legume?? ?